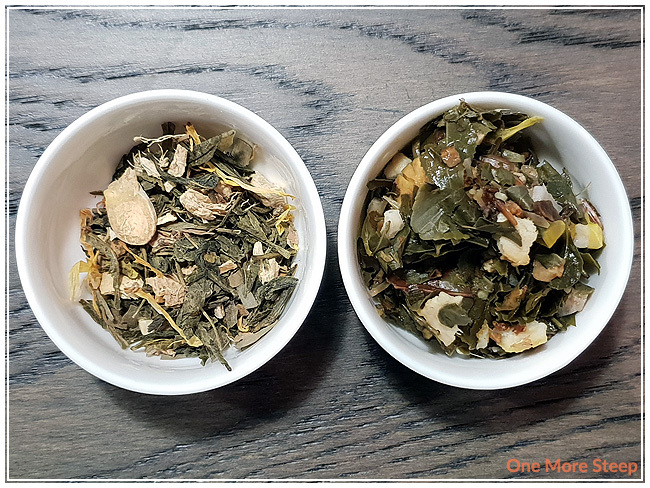 I was first introduced to Woash Wellness via Instagram, prior to the launch of their teas in the autumn of 2018. I got to meet Cassy of Woash Wellness at the 2018 Vancouver Tea Festival, which was pretty neat. After following her account on Instagram and seeing all these beautiful teas, I got to sample them before buying them. I often find it a struggle to decide if I want to buy online based on a photo or a description because so much of what I love about tea and tea drinking is the aroma and the taste of it – that’s why I always try to do my best to describe the flavour profile of any tea that I’m reviewing. 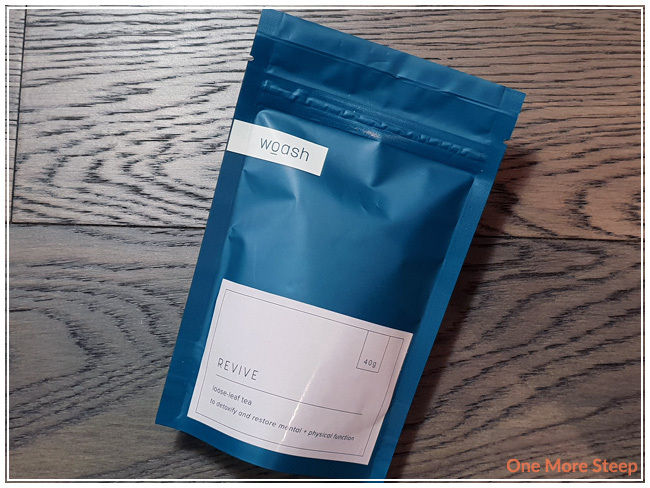 Revive is one of the teas that I bought directly from Cassy of Woash Wellness. The tea blends from Woash come in this fun, dark blue pouches – they’re sealed, resealable and the labels have all the necessary information regarding steeping instructions and ingredients. Revive is described as a tea meant to help the morning-after a fun night out, if you know what I mean… The first thing I noticed about Revive is the strong smell of ginger. Ginger is a very overpowering ingredient at the best of times, and it’s definitely very strong here. I can also smell the lemon and a hint of the green tea base. Revive consists of: sencha green tea, ginger, milk thistle, lemon peel, ginkgo, and calendula. All of the ingredients are very much visible, and I didn’t even have to shake up the pouch – I don’t think a lot of settling has happened with this blend for me. Woash Wellness recommends steeping Revive at 175°F (80°C) for 3 to 4 minutes. Because of the green tea base, I followed the steeping instructions and opted to keep my initial steep of Revive at 3 minutes. Revive steeps to a pale yellow-green colour. The aroma is primarily that of the ginger, which isn’t a very big surprise considering how prominent it was in the dry leaf. There’s a light sweetness to this tea, and I found some mild umami notes from the sencha. 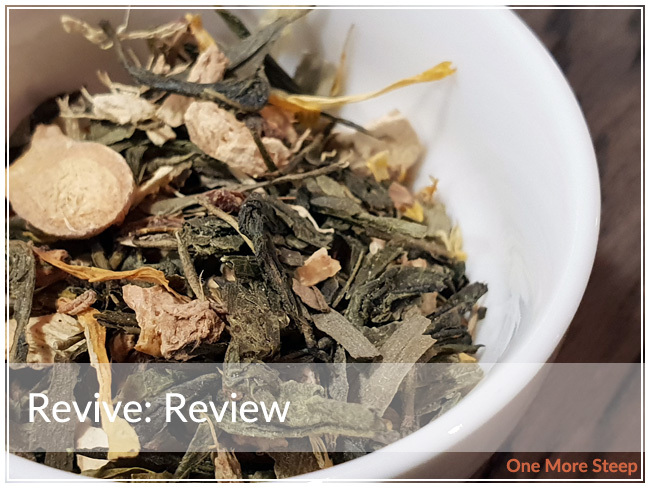 I noted that Revive does have the nice warming qualities from the ginger, which makes it very pleasant and would also serve to help settle the stomach while well if you were to drink this while hungover or with an upset stomach of other origins. I like how the ginger is balanced against the sweetness and the umami qualities of this blend so it wasn’t just ginger that hit me in the taste buds. I resteeped Revive two times, adding an extra 30 seconds for each subsequent steep. I found that the flavour was quite comparable to the initial steep for the first resteep and still had a good amount of ginger flavour. 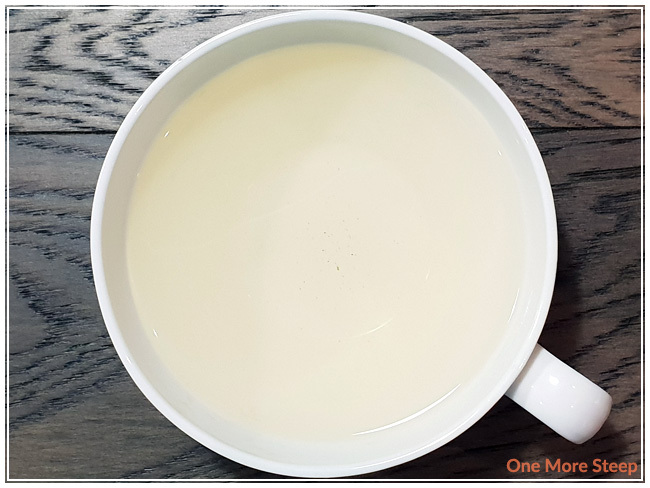 The second steep was a bit watery in comparison, so I would recommend keeping Revive to just one more steep – unless you had a little bit of fresh or dried ginger on hand to help boost the flavour a little bit. I loved Woash Wellness’ Revive. I’ve been in quite the ‘ginger’ kick lately and I think this just really worked for me. I didn’t drink it while hungover, but I do like the effects of ginger on the stomach – it’s such a great ingredient that really does help to settle stomachs and just really works in warming you from the inside out, a fantastic quality in a tea that I’m drinking when it’s -2°C outside (that’s below freezing for my friends who use Fahrenheit…). 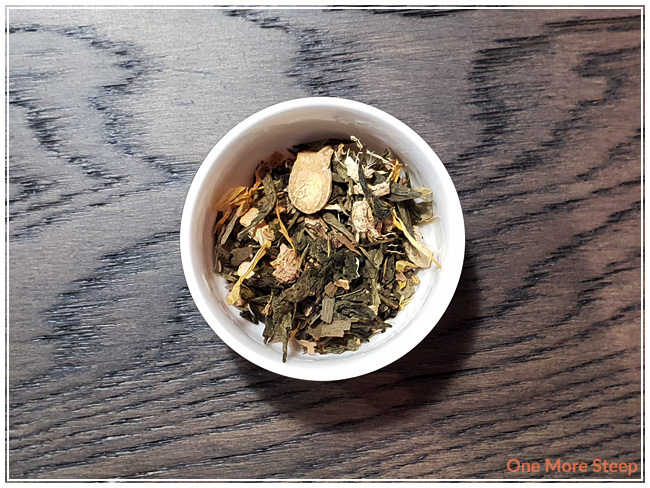 I really enjoyed how well balanced the sencha green tea was with the ginger – I was expecting the ginger to overpower the green tea and was really happy that this was not the case. While I do wish that the lemon was more prominent, I do understand that it was competing with some very strong flavours in the blend but I like to think that the lemon did attribute to the sweetness that I found in my cup.